For many, the campfire is an indispensable long-standing outdoor tradition. Either for keeping you warm throughout wintery nights or simply for huddling around, no camping picture is complete without the image of a burning fire. 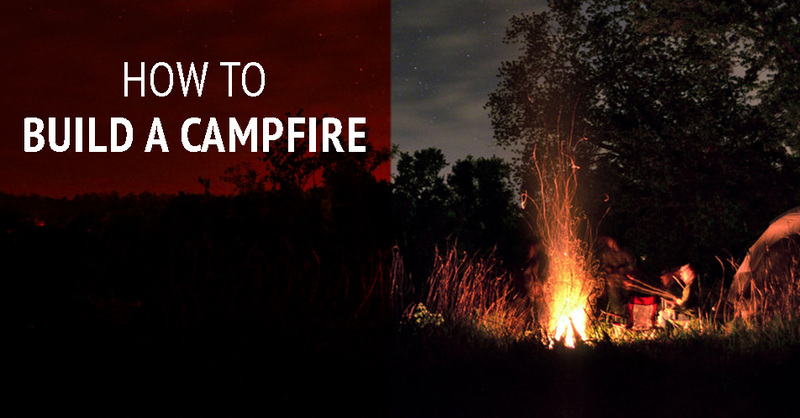 In this article, we will explain the key steps for building a safe campfire. If you’re camping in a campsite, stick to the designated firepit areas and follow safety rules. If camping in an uninhabited area, evaluate the site and choose a spot clear of low vegetation and low-hanging branches. Ideally, build your fire on bare dirt, which is the safest type of terrain for this purpose. Remove any flammable material and dig a large dent, where the center point should be the most depressed to provide a safe natural container. Finally, collect medium-sized stones and position them side by side around the dent. Gather your tinder and kindling wood, making sure they’re completely dry and dead. Tinder is any very small pieces of material that are highly combustible and therefore catch fire quickly, including: dry leaves, dry grass and any dry bits of wood. Kindling wood consists of slightly bigger combustible material like small, dry branches that will catch fire from tinder. Lastly, go for a walk and collect your firewood from the area surrounding your fire pit. Make sure you gather long, dry pieces of wood that are approximately the length and width of your arm and feels desiccated. There are several ways to lay your fire, but in this article we will focus on the cone-shaped fire. Start with a small cone of kindling around a few handfuls of tinder that are loosely piled in the center of the fire ring. Once the fire is going strong and the temperature increases, you can add larger logs as needed. Light the tinder with a match or lighter. A fire starter, like NTK’s Azteq Fire Starter, made of ABS and flint, will make the act of lighting the fire much easier. After lighting the tinder, blow lightly at the base of the fire to provide oxygen, which will help increase the intensity of the flame and further ignite the wood. As the fire burns, move embers to the center to burn them completely. This is the saddest part of evenings around a campfire, but it’s also crucial. Start to extinguish your fire at least 20 minutes before you go to bed or leave the camping site. Lightly sprinkle water onto the fire bed and stir the embers and ashes with a stick. Heat test the fire by holding the back of your hand close to it. If it’s too hot to keep your hand there, the fire is still too hot to leave. Continue to sprinkle water and stir until safe to leave.